Ankarsrum Assistent Original Mixer Black Chrome 6230 Basic Package includes: 7 1/8 quart stainless steel bowl, dough hook, dough roller, scrapper and spatula, beater bowl, balloon and cookie whisks and 7 years warranty. Hurry and get yours now while quantities last. 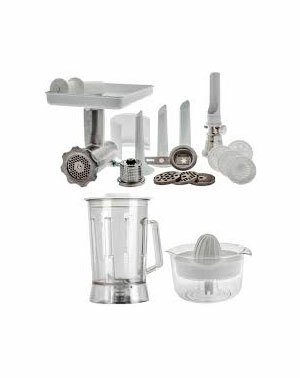 Also available extra attachments; Deluxe Package, Meat Mincer Basic, Meat Mincer Hunters, Meat Mincer Harvest, Meat Mincer Complete, Grain Mill, Flaker Mill, Vegetable Slicer, Extra Drums, Blender, Citrus Juicer. Ankarsrum Assistent Mixer Black Chrome Technical Specifications Data • Output: 600 W on 110/120 V • Height/Width/Depth: 360 mm x 268 mm x 400 mm. • Weight: 8.6 kg • Continuous speed control. • 12 Minute timer. • Overload protection. • Capacity: 5 kg (11 lb) dough or 1.5 litres (7 cups) of liquid dough. Mixer Features: • Modern styling. • Continuous timer and speed control. • Unique gear system located under the bowl giving it extreme power for the wattage. • Speed sensor adjusts speed to load. • Overload protector. • Open bowl design for easy cleaning. • Motor, die casting and assembly all done in same factory. • European design and manufactured. • Smooth quiet operation. • Unsurpassed strength and durability. • Backed by more than 60 years of reliability and service in European kitchens.